Starlight is a great option for small budgets. This recycled rubber flooring is available in roll or in tile format. 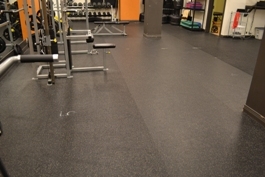 SportWeave™ Fitness Flooring combines the comfortable appearance of carpet with the versatility, ease of maintenance and durability of a rubber surface. It’s polypropylene fiber withstands moisture, stains, and the long-term placement of free weights and selectorized machines. The fast-drying surface is antimicrobial, so it won’t rot, stain or mildew, and can be cleaned employing standard shampooing methods – all backed by a 7-year abrasive wear warranty! A dramatic reduction in the total lineal feet of seams an especially important feature for healthcare applications. Excellent dimensional stability. Will not shrink like other floorings can. Requires no sanding, repainting or special surface treatment. Can be "flash coved"- turned up on the wall to eliminate a dirt - catching cove base seam. "Flow" of marbled look not interrupted by cutting to achieve a floor pattern, or when inserting a special design or logo. Patterns, game lines, etc. are cut into the floor at the time of installation eliminating the need to repaint lines. Flooring, stair treads and landing tile are easily design coordinated. The color and pattern range is exceptionally broad. Plus we have a custom color option to meet your individual design needs. Soft underfoot and comfortable to walk on. 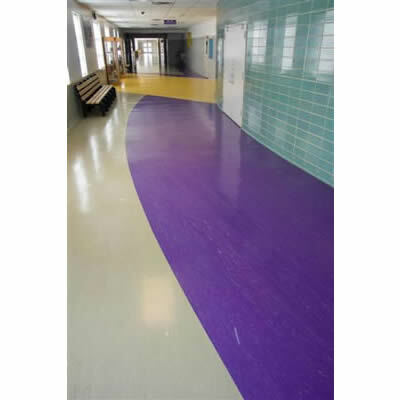 Withstands scuffing, grinding and heavy foot traffic. With a top-to-bottom wear surface, rubber flooring is not only long lasting, but it will look good for years. Does not need special waxes, sealers, dressings or other finishes to maintain its appearance. This reduces expensive labor and chemical costs. Hence, maintenance costs are significantly reduced. S Graham offers a variety of wood flooring options for commercial spaces including: solid hardwood, prefinished wood, and engineered wood flooring.